What you are looking at is the shadow of what once was. The City Of Wilton Manors is Gone. Not the people or the businesses, but the City Government. We have built the new City Hall and moved our Government offices and officials down the block to a new building that is quite sorely needed. As a part of my duties as being on multiple Volunteer boards for the City, I was fortunate enough to get into the old City Hall before they flatten it. The decision for the date will be made shortly, and all that will be left will be dust and memories and pictures. This particular entry was where if you had business with the City, you would walk up these stairs past the sign that is now gone, with the exception of that Letter N and enter the door to visit the folks at the front desk. Some of the nicest people I have ever met work at City Hall, and have worked at this building in the past. 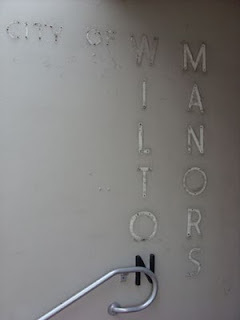 The sign is gone and was donated to the Historical Society of Wilton Manors. We were able to get everything but that Letter N because the railing was sunk in with Masonary screws. Larger than the Number Two Philips Screwdriver that everyone has around the house, and BOY do you need some serious Torque to get those out. We couldn't just pry the bar or cut it off since the City intends to reuse that railing so we're either going to come up with a drill to drill out that screw or find a really big screwdriver. Diane will have the "N" to complete the set, and the building will be demolished. I have other pictures and will put some of them up as time allows. The whole "Deconstructionist" feel of these shots is a bit eery to me, but fascinating. It won't be like the Motorcycling Girl of Chernobyl, I simply don't have enough pictures and there was just too much wear and tear to document it all, but an occasional shot may interest those in the City and those who are connected to it from afar.